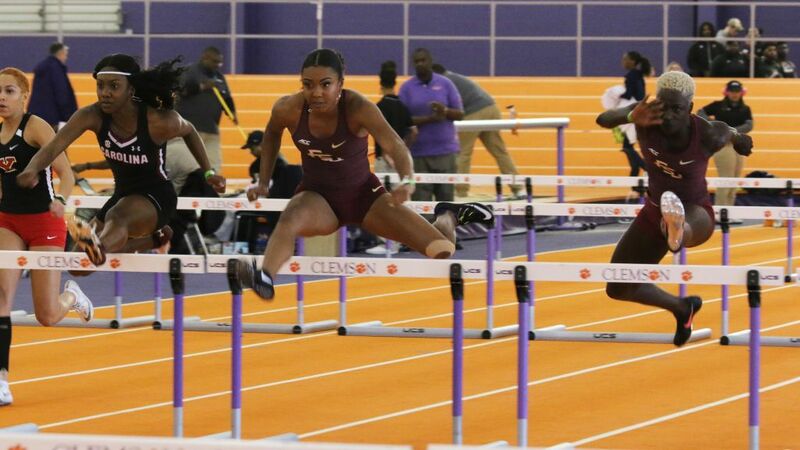 CLEMSON, S.C. – By any measure – wins, personal-bests, national and world rankings, and records – Friday’s indoor season-opener for the nationally-ranked Florida State track & field teams at the Orange & Purple Elite meet was a rousing success. “Top to bottom, that’s the best season-opener in all my years at Florida State,” said 16th-season FSU coach Bob Braman, who has hoisted three NCAA Championship trophies at the helm of the Seminole men and women. • Six Noles – James, Kirkland, Sow, Ashley Miller (60 hurdles), Karimah Davis (200) and Nadia Maffo (weight throw) – produced top-10 event marks in program history. In the process, Seminole legends Ngoni Makusha and Kim Batten were knocked from the top 10 in the 60 dash and 60 hurdles, respectively. The Noles came into the meet riding day-old preseason national rankings of No. 2 (women) and No. 3 (men) and proceeded to validate them with 10 event victories and 21 personal-bests; underscored, perhaps, by a lineup including 16 first-time performers in garnet and gold. Sow, a graduate transfer from South Carolina, got the ball rolling with the best season-opening long jump series of her career. At ease competing against her former teammates, the four-time All-American from France soared 6.42 meters (21-0.75) for the win; the No. 5 mark in FSU history and just 4cm off her personal-best. 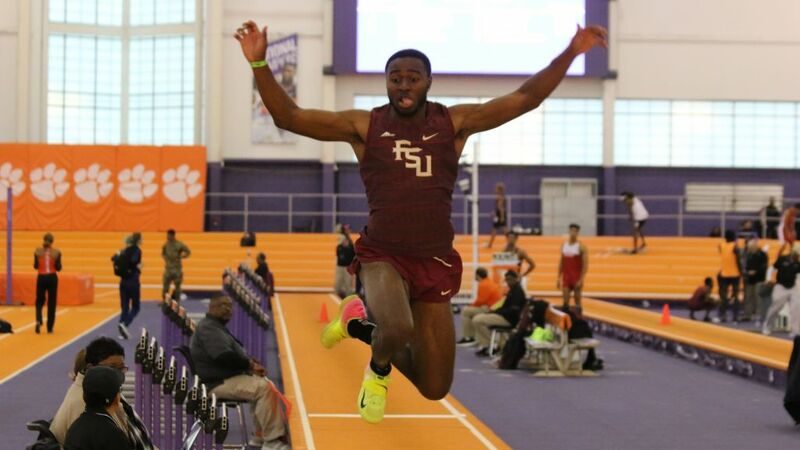 With the morning field events in the books the action shifted to the track and the Noles immediately rose to the occasion. Rincher got things started by winning the first 60-meter prelim heat in 6.64; good enough to take over the NCAA lead. Two heats later, James rocketed from the blocks and never looked back, racing to the top qualifying mark and world lead in 6.57. In the process of annihilating his previous-best (6.73), James took over the No. 7 spot on FSU’s all-time list. The Noles advanced five to the 60 finals, with seniors Darryl Haraway and Michael Timpson Jr. joined by freshman Jhevaughn Matherson. NC State’s Cravont Charleston upstaged the Noles with the win in 6.59, with Rincher (6.60) and James (6.60) followed by Haraway (6.72) and Matherson (6.74) as FSU nabbed positions 2-5. Four of the five finalists improved on their preliminary times. Rincher broke Haiti’s national record (6.62), set by Virginia Tech standout Darrell Wesh in 2016, but wasn’t satisfied with the way his day turned out. Braman had a decidedly different view. Jones led a trio of women’s 60-meter hurdlers into the finals, joined by Miller, a redshirt junior transfer from Texas, and Sow who moonlights clearing barriers when she’s not long jumping. Fourth at the NCAA Indoor championships last year, Jones got a bit of early-season revenge against Georgia Tech’s Jeanine Williams, defeating her rival and the defending ACC champ in 8.12 to take over the early NCAA lead. Miller was third in 8.24, unseating Batten from the top 10 with the No. 7 time in FSU history, while breaking her previous personal-best set in 2016. 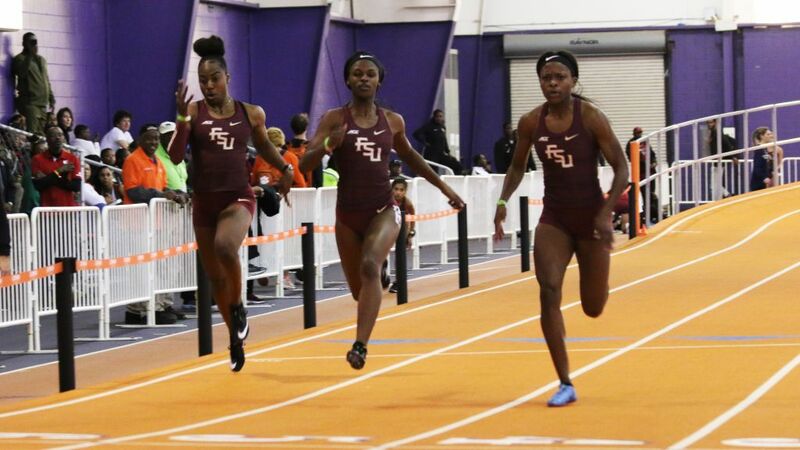 The Seminole women claimed the top four spots in the 200-meter final as Jayla Kirkland made her indoor collegiate debut at that distance in 23.33; third-fastest in program history and No. 1 in the world. She was chased across the line in heat one by Ka’Tia Seymour (23.39) and Shauna Helps (23.67). Redshirt freshman Karimah Davis followed in heat two by racing to victory in her collegiate debut with a personal-best (23.62) which thrust her into the No. 7 spot on FSU’s all-time list. Not to be outdone, senior men’s sprint star Andre Ewers mowed down the 200-meter field for the win in 20.94. FSU’s distance groups contributed to the day as well with Jodie Judd and Michael Hall claiming the 3000-meter titles in 9:52.08 and 8:13.20, respectively. Judd led from the gun, while Hall dueled with former teammate and Seminole volunteer coach David Barney throughout. Earlier, Judd was part of a strong effort in the women’s mile as four Noles were the first collegiate athletes across the finish, led by Maudie Skyring (4:47.36) and Megan Mooney (4:52.38). Wallace was solid in the triple jump, virtually assuring himself a trip to the NCAA Indoor Championships with a winning effort of 16.01 meters (52-6.50), good for the NCAA lead despite working from a short approach. The Noles also received wins from Kyle Fearrington (400), Olivia Ogles (pole vault) and Ellie Wallace (800).